Posted By: maryyugo There is not once chance in hell that he has something. I think we will have to agree to disagree on this one Mary, I think he does. How many "chances in hell" are required? Yes indeed. Seems he has so little to show that he has confused at least two dozen physicists and even more engineers plus the due diligence processes of two serious investment funds and two certification outfits while promising and demonstrating the impossible for at least 5 years. If he really has nothing he will make Bernie Madoff look like a rank amateur. ETA. Sorry to hear you got banned Mary, you were the salt in the LENR forum sandwich. I have an issue with that concept. Posted By: tinker Yes indeed. Seems he has so little to show that he has confused at least two dozen physicists and even more engineers plus the due diligence processes of two serious investment funds and two certification outfits while promising and demonstrating the impossible for at least 5 years. This is why Rossi is interesting. He has indeed, bamboozled, flummoxed and mesmerized a lot of people, many of whom should certainly know better. You left out a Nobel laureate (Josephson who is actually not that hard to fool). 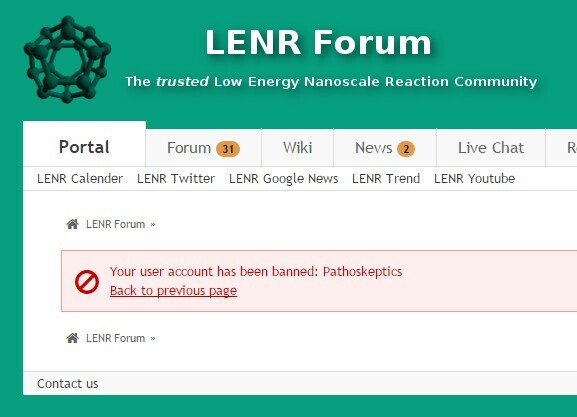 As for being banned, LENR Forum can't take much bare naked truth. They require it to be extremely tactful or better yet, not at all. But until he hits the billion dollar mark, Rossi is no Madoff! ETA:Oh wait, Tink. I carelessly let you get away with this bunch of hokey: "two certification outfits". WHICH TWO and WHAT CERTIFICATION? Surely you don't mean the toothless and worthless SELF-certification Rossi reported? Hey, I can do that myself for my unicorns. Invisible unicorns are very safe unless you get them upset. Posted By: maryyugo ETA:Oh wait, Tink. I carelessly let you get away with this bunch of hokey: "two certification outfits". WHICH TWO and WHAT CERTIFICATION? Surely you don't mean the toothless and worthless SELF-certification Rossi reported? Hey, I can do that myself for my unicorns. Invisible unicorns are very safe unless you get them upset. None of the above. And not in the public domain yet. The idea that Rossi couldn't fool so many people is somewhat undercut by the success of Der Donald. That's very true. Disney was a genius. Brillouin Energy Corporation: A Berkeley, California pioneer in the field of LENR, their proprietary Q-Pulse technology and Controlled Electron Capture techniques can be the source of large amounts of excess heat energy at very low cost. LENR Cars SA: This Swiss-based company is developing mobile electric generators based on the LENR technology to power electric vehicles or provide heat and electric power to regular vehicles. LENUCO LLC: This Champaign, Illinois-based company develops and commercializes LENR technologies, especially those focused on cells using NI alloy nanoparticles. LENUCO holds several highly valuable patents related to LENR core technology. Meanwhile, of the papers recovered by Gary Wright about Rossi's thermoelectric scam, one was not made available by Gary. Believers thought that this was because the document had the smoking gun that proved Rossi really had a high efficiency prototype. So I obtained it. It doesn't. It does have what purports to be test results and they do show high efficiency however, in typical Rossi fashion, there is nothing about who did the work except for the usual vague attribution, in this case to "the University of New Hampshire." Here is what I wrote in ecatnews. Appendices B and C were not available according to the FOIA admin I wrote to, because they could not be found. His bio says he worked for Parsons until Sept 1999 and then started to work immediately after for Leonardo Technologies Inc (LTI) which at the time, deeply involved Andrea Rossi. So much for Mr. Munson’s veracity and objectivity. It’s possible though uncertain that LTI has gone legit but I can’t find anything worthwhile that they have done. It’s easy to spout nonsense for decades and still get government contracts. I am not saying this is what they did but it’s certainly possible. LTI is not the same as Leonardo Corporation, Rossi’s current company. Rossi has always woven a confusing web of corporations, companies and publications. Most con men do that." Posted By: tinker None of the above. And not in the public domain yet. So more Rossi-says, right? Or some flunky of Rossi's or believer in Rossi says. There is something enigmatic about Rossi. I have no doubts he is a scammer, and I can preview his next steps usually pretty well, but there is one thing I can't understand, and which troubles me. I have absolutely no idea how he succeeded to manipulate the team doing the Lugano test. I do not know whether some of them are conscious accomplices, whether he corrupted some of them, or all of them, or whether he tricked them out with some illusionist trick, or used some smart technical wangle, or whether there is something else behind the results. Well, I know that the test methods used and the results measured are far from any true proof, and were criticized by experts, but I am still let in bewilderment about the degree of the manipulation Rossi achieved here, and do not understand how it was done. Angus is probably a chap. Surely you mean His Donald?